In 2018, the mix of politics and sleazy info-tainment is quite commonplace. It was only just hitting the surface when the Gary Hart’s presidential campaign shattered 31 years ago. Hart quit his bid after reporters from The Miami Herald managed to corroborate evidence that he was not upfront about his affair with Donna Rice. The tip had been from an anonymous source of a phone call given to a reporter. Hart never entered politics again. In early 1987, polls indicated that Hart was the clear early front-runner of the ensuing presidential elections. A theoretical matchup with ultimate winner George H.W. Bush had Hart roundly defeating him. All that came crashing down…within a week, and his campaign ended just 26 days after it began. 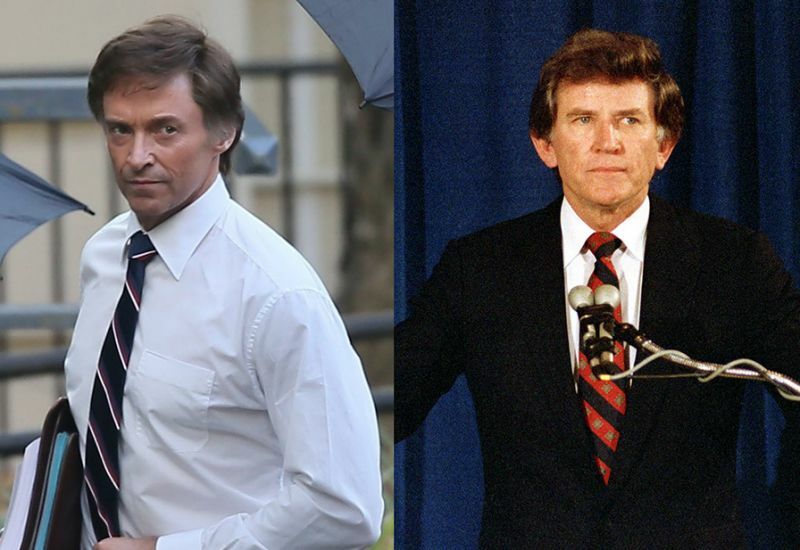 The events of Hart’s doomed campaign is at the center of Jason Reitman’s wonderfully perceptive and frothy “Front Runner,’ – a film so perfectly-cast, and perfectly performed by its lead, Hugh Jackman portraying the mysterious Hart. “The Front Runner” delves into the conflict of candidates’ privacy versus what the voters ought to know about their own foibles. Leading up his scandal, Hart – much to his prophetic downfall – told reporters to “follow [him] around,” and see if they could find evidence of adultery. “All of us must try to hold ourselves to the very highest standards of integrity and ethics, and soundness of judgment,” Hart had told them. His friendship to Warren Beatty only fueled further speculation of lingering possibilities. Reitman co-wrote the film with Matt Bai and Jay Carson. Bai, then a chief political correspondent with The New York Times Magazine, wrote the best-seller “All the Truth is Out: The Week Politics Went Tabloid” in 2014, which chronicled not only the scandal, but the media’s changing attitudes. Carson had been a political operative. After reading Bai’s book, Reitman knew it would adapt into a compelling film. Indeed, the film’s Robert Altman-esque style of free-flowing conversations in newsrooms, bars, hotel rooms, give the viewer a front row seat to a delirious political campaign. Iconic performances are throughout the film, portrayed by Alfred Molina as Ben Bradlee, JK Simmons as Hart’s campaign manager and Vera Farmiga, as Hart’s wife Lee. Sara Paxton as Donna Rice, in particular, gives a most sympathetic performance. “Paxton was perfect, when you consider the fact that we’re meeting her at the moment that her life has just been changed forever,” Reitman told Uproxx. “The Candidate [starring Robert Redford, 1972] became the North Star for the film,” Reitman said during Tuesday’s press screening. “There’s something about the tone, the style, in which the movie attempting to place you in the room – whether you were at a newspaper, or on the campaign trail, we wanted it to be real. The film’s trajectory is within the course of three weeks. Gary Hart, and his wife, Lee, remain married. “The Front Runner” will be released nationwide on Election Day. My experience is writing, reporting, and documenting personal narrative pieces through articles and the creative arts. My writings and articles often concern foreign policy, but I remain passionate about the importance of press freedom, largely in nascent democracies. I continue to interview dissidents, filmmakers, ambassadors, poets, and self-censored journalists, oft-times in regimented societies.